The Woods Landing Resort is a historic roadside retreat located at the base of the Medicine Bow Mountains, approximately 27 miles southwest of Laramie, Wyoming. We offer a full service restaurant, bar and dancehall, as well as a general store, post office, cabins, and RV camping. Lodging at the Woods Landing Resort includes a the fully furnished River Guest House, a new luxury log cabin duplex, six rustic log cabins and 10 RV spaces. In all, we can sleep about 36 people in addition to RV spaces so we are a perfect venue for family reunions, weddings, and just plain fun. The dancehall, which was placed on the National Register of Historic Places in 1986, was constructed of hand hewn logs that required no chinking, as they were hewn to fit tightly together. The most distinctive feature of the dancehall is the floor. Beneath the oak inset patterned floor are 24 boxcar springs that give the floor bounce and flexibility. This is the only floor of its kind known to still exist in the area. 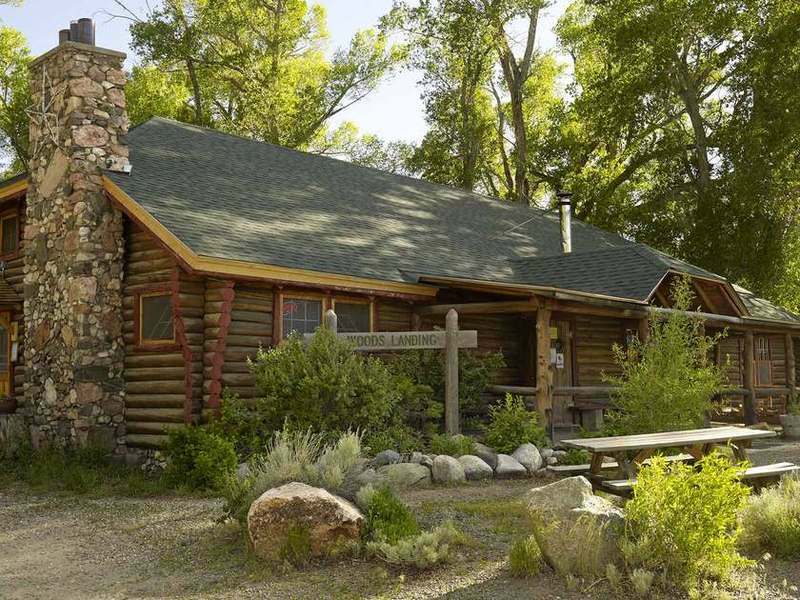 The guest house is a fully furnished 3 bedroom cabin located on the bank of the Big Laramie River. The Aspen North and South cabins are a duplex cabin that can be rented separately or as a suite with an inside door that can be opened between the two units. The Aspen South cabin has two queen beds, a small couch, an easy chair, a private bath with a shower, a kitchenette equipped with a hot plate, microwave, toaster oven, and coffee pot and a small dining table. Both Aspen cabins have satellite TV and gas log stoves. They share a large covered front porch, two picnic tables, charcoal grills, a fire ring and a great view of Jelm Mountain and the Big Laramie River. The Aspen North cabin has a king bed, double futon, full bath with a tub, kitchenette with a stove and oven, microwave, toaster, coffee pot and a dining area. Both Aspen cabins have satellite TV and gas log stoves. They share a large covered front porch, two picnic tables, charcoal grills, a fire ring and a great view of Jelm Mountain and the Big Laramie River. Cabin #2 is a rustic cabin that is equipped with a 2 queen beds, refrigerator, hotplate, and gas heater. The rustic cabins have no running water and require the use of the bathhouse for showering and toilet. Cabin #3 is a rustic cabin that is equipped with a 1 double bed, a living room area with a woods stove, refrigerator, hotplate, and gas heater. The rustic cabins have no running water and require the use of the bathhouse for showering and toilet. Cabin #4 is a rustic cabin that is equipped with a 2 double beds, refrigerator, hotplate, and gas heater. The rustic cabins have no running water and require the use of the bathhouse for showering and toilet. Cabin #5 is a rustic cabin that is equipped with a 2 double beds, refrigerator, hotplate, and gas heater. The rustic cabins have no running water and require the use of the bathhouse for showering and toilet.